"I always liked watching Tiger Woods play golf because they said he has more tricks in his bag with his clubs than anybody else does. He can hit a 3 iron ten different ways. And I've always wanted to be the kind of runner, in an 800 especially, that can win any way you throw it. If we go out in 24, if we go out in 28, if it's fast, if it's slow, if I'm buried, if I'm boxed or if I'm free I want to be able to win any different way. I think my Division III background gave me a lot of chance to practice those skills. I think that's one of the reasons I've been able to pull off these wins the last 5 years.."
NO ONE IS GOING TO MENTION GAY'S 9.75 IN THE SEMIS? Lolo Jones Runs 12.50 Stadium Record in Semis, Brianna Rollins Runs Wind Aided 12.33 She also talks about the half empty stadium. LeMaitre: "It’s about my speed, not my skin colour"
LRC Women's 1,500 Prelims: The Mary Cain Show Makes The Final Mary Cain and her training partner Treniere Moser dominated on the track and then entertained off it as most of the favorites advance. Morgan Uceny advanced but didn't look pretty doing it. LRC Men's 1,500 Prelims: The Cream Rises To The Top link fixed The 1,500 prelims had the unfortunate situation of 47 runners being narrowed down to 12 for the final and fortunately all the favorites advanced as Centro looked great, Leo Manzano showed why he's an Olympic silver medallist, and much more. LRC Men's 800: Favorites Advance, Robby Andrews Goes Home Recap, results, and video interviews. LRC Women's 800: Martinez And Montano Look Good Recap, results, and video interviews. Hannah England Running 1,500 This Weekend: "In the 1,500m you have the opportunity for just one defensive move and one offensive move in a single race." British Captain Perri Shakes-Drayton Doesn't Want To Be Thrown In Steeple Pit If TeamWins; "My hair. I don’t want that. It will ruin my hair." 3-Time Olympian Lee Trop Compares 18-Year-Old Jake Birtwhistle To Craig Mottram www.examiner.com.au The 18-year-old has an 8:09 3k PR and was 41st at World Jr. XC. 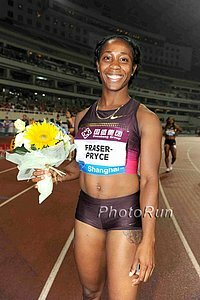 Women's Preview For This Weekend's Jamaican National Championships (World Trials) In the 100, Shelly-Ann Fraser-Pryce qualifies automatically as last year's DL winner, while Veronica Campbell-Brown's positive drug test rules her out, so the battle for the top three spots this weekend is wide open. Jamaican Observer: "Sadly We've Been Down This Road Before: VCB Adds To List Of Jamaicans Failing Drug Tests In Recent Past" Others include Steve Mullings, Dominique Blake and Sheri-Ann Brooks. Inside Source Says VCB Drug Issue Has Been "Overblown" And She Could Just Receive A 3-Month Ban Or Even A Public Reprimand The source said, "No serious drugs were involved, no PEDs were involved, that's all I will say." However, the articles goes on to mention that diuretics are a possible masking agent for the use of steroids. President Of Jamaica Olympic Association Mike Fennell Pleads With Public And Media To Not "Jump The Gun" Over The Veronica Campbell-Brown Drug Test "There is no question that news like this, if not properly controlled, can be very damaging to Jamaica ... Let us not jump to final conclusions before we have gone through the process and know exactly what the facts are." Because The Idea They Would Intentionally Dope Is Just Crazy: Glen Mills (Usain Bolt's Coach) Says The Government Needs To Establish An Anti-Doping Lab In Jamaica To Protect Its World-Class Athletes From Taking Contaminated Substances Talking about VCB, he said, "It just re-emphasises the need for all involved to be extremely vigilant ... It's a minefield out there. Any substance that you take up could be contaminated." *MB: Wallace Spearmon backing VCB - "She wouldn't do anything like that." VCB's "B" Sample Test Positive For Diuretic The Jamaica Gleaner is reporting Veronica Campbell-Brown's "B" sample came back positive as well for a diuretic. The drug is supposedly Lasix, which is also given to horses. LRC Men's 1,500: Oregon's Mac Fleet Kicks To Victory To Delight Of Hometown Crowd Fleet was third at PAC-12s but first at NCAAs as he provided the in-stadium highlight of the 2013 NCAA champs while the crowd went nuts. 4:21 HSer Zach Perkins of Air Force was the runner-up as a true soph. We recap that plus post-race shoving shenanigans. *Oregonian: Duck men 4th, but Mac Fleet's 1,500 victory reverberates Fleet is full of praise for coach Andy Powell. "(He) believed in me, I think, more than anyone, that I'd be able to bounce back. Without Andy, I don't think I'm here (with a title)." LRC Men's 5,000: Lawi Lalang Defeats Two Fresh Sub-13:20 Guys To Complete The 10k/5k Double Paul Chelimo and Diego Estrada were a very respectable 2nd and 3rd. *MB: Who exactly are the best in their events to never win an NCAA title? Team Competition: Wild 4 X 400 Finish Results In Texas A&M And Florida Sharing NCAA Team Championship With 53 Points Texas A&M's powerhouse 4 x 400 team dropped the stick and only scored a single point as Florida won the event to miraculously tie A&M. Amazingly, in the year 2013, there is no tiebreaker. Arkansas was 3rd (46.5) and Oregon 4th (44). *MB: Pat Henry leaving A&M for University of Texas? *Mike Holloway Pleased With Tie: "There's the old saying (about ties), it's like kissing your sister. I love my sisters." *MB: Why the hell is there not a tie breaker for the team Champion at NCAA Champs?!?!?!?! *MB: WTF: Did Dwight Stones Just Screw Up the NCAA Team Title on ESPNU? LRC Men's 800: Elijah Greer Wins NCAA Title Number Two, Denies Cas Loxsom Of Coveted Title Number One The two seniors both wanted this one badly and were way better than everyone else in the field. *R-G: "Elijah Greer closed out his Oregon career by accomplishing what everyone expected when he arrived." 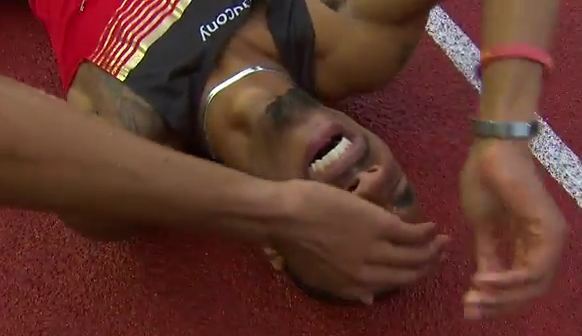 LRC Steeple: Anthony Rotich Wins As Henry Lelei Goes Down On The Final Water Barrier The Kenyans up front ran super-fast as Rotich came into NCAAs with an 8:37 PR but left with an 8:21 IAAF "A" standard. Former US junior champ Curtis Carr of BYU got top American honors. LRC Women's 800: Alysia Montaño and Brenda Martinez Still Look Good, Maggie Vessey And Phoebe Wright Go Out Brenda Martinez showing some Joe Vigil strength with a negative split sub 2:00 800m. LRC 2013 USATF Men's Steeple Prelims, Jager, Leslie, Huling Impress Jager talked about the rest of his 2013 season which will include only a steeple at Worlds. LRC Women's 5,000 Preview: Last Year's Race Was Truly Epic; Let's Hope for An Encore Shalane Flanagan, Jenny Barringer, and Molly Huddle. It doesn't get better than that. USAs Friday OTB: NO ONE IS GOING TO MENTION GAY'S 9.75 IN THE SEMIS? He also ran a wind-legal 9.75 to win the final. Men and Women's 800m final at USAs!!! Stackeddd! Could Brandon Johnson Break Symmonds Win Streak? Berry Berry DQd in 400. WOW!!! Lolo Jones 12.50 Wind-Legal Stadium Record Brianna Rollins ran a wind-aided 12.33 about 5 minutes later, which would tie the AR. Recommended Read: OTC's Marc Rowland Talks About The Prospects Of OTC's Athletes For 2013 USAs link fixed Nick Symmonds, Tyler Mulder, Hassan Mead, Julia Lucas. He's got you covered on everyone from Bridget Franek to Aisha Praught. LRC Men's 1,500: Centrowitz, Lomong, Manzano And Wheating - At Least One Of Them Is Going Home Very Unhappy What an interesting race. If things go according to form, one stud is left home. If Will Leer or Russell Brown have that day they have dreamed of, then two are left home. *RW: Is Something Wrong With U.S. Milers? A Year After The US Gets It's First 1,500 Olympic Medal In Years, No One Has The "A" Standard Quotes from Centrowitz and Russell Brown; neither of whom are worried about the "A". They know who whoever finishes top 3 will get it in Europe. LRC Men's Steeple: Evan Jager Will Win, But Who Gets Second And Third? Our only question about Jager is, "Does he break 8:00.00 this year?" We think we know who is getting second and third as the #3 seed has 6.5 seconds on #4. LRC Men's 800: What A Field! Even Olympic Finalists Nick Symmonds And Duane Solomon Have Reason To Be A Tiny Bit Nervous The men's 800 is full of talent. Is there another event at USATF that has 13 contenders for the Moscow spots? We'll tell you who the favorite is and break down the chances of wild card Robby Andrews. LRC Men's 10k Preview: Rupp, Derrick, Ritz Or True - Who Doesn't Go To Worlds? For the first time ever, 4 men (Galen Rupp, Chris Derrick, Ben True and Dathan Ritzenhein) will be running the USATF 10,000m all having run under 13:15 for 5,000m earlier in the year. Only three of them can go to Worlds. Who will be the odd man out? *Profile For This Weekend's US Half Marathon Champs Abdi is racing for the $ as making the 10,000 team isn't realistic for him. More: Sophomore Two-Time NCAA Champion Ashley Spencer Resisting Calls To Turn Pro Early She is largely following the advice of Illinois coach Tonja Buford-Bailey, who has said, "People who know the sport know that this is just wrong, what's happening with kids leaving school early." 4th, 4th, 5th Last 3 Years, Tyler Mulder Is Tired Of Being Left Off USA Teams - Wants To Win In Des Moines "I'm not thinking about anything but winning," Mulder said. "Winning is my No. 1 goal. That has to be the only thing to shoot for. From there, it's making the world team. This is my coming out year. It's time for me to step up." Justin Gatlin Wants To Prove Beating Usain Bolt Wasn't A Fluke: "To me, beating Bolt was just another check list. All right, I beat him. I have to do it again and again." Tyson Gay said, "A good boost (for Gatlin), but at the same time, everybody knows the world record holder wasn't ready and that he's waiting to perform on the big stage. Until you dominate on the big stage, it really doesn't matter." Des Moines Register Article Sizing Up The Battle Between Des Moines And Eugene For Hosting The 2020 Olympic Trials Des Moines supposedly needs to make a good impression this week if they want a chance. We 100% disagree. If the Trials go to Des Moines, they'll sell out regardless of this weekend's attendance. Ken Goe: "How serious is Des Moines about hosting the 2020 Olympic Trials? We'll get an idea this week." "Lots of empty seats in Drake Stadium [this week] won't help make the case for Des Moines." Semenya's Agent: "She is recovering very well and practice is going well." Apparently Semenya had poorly done knee surgery at age 12 that is bothering her. EA Talks To Great Britain Captain Shakes-Drayton Ahead Of This Weekend's Euro Team Championships Apparently there is a tradition where the winning team's captain is thrown into the steeple pit after the meet. IAAF Profile On 16-Year-Old Brit Morgan Lake, Who Set A Girls Youth World Lead In The Heptathlon With 5725 Points At English Jr. Champs Her goal is to win the World Youth Champs this summer in the Ukraine. Marlou van Rhijn Becomes Fastest Female Leg Amputee In The 100 With 12.96 In Berlin She was already the WR hodler for double leg amputees, but now she's faster than all single leg amputees as well. Disgraced Canadian Olympian Ben Johnson Anchors 4 X 100 Team To Victory At Toronto Meet At 51 Years Old Johnson was stripped of his 100 gold medal and WR after testing positive at the 1988 Olympics. Usain Bolt And Yohan Blake Will Split Wild Cards For World Champs With Bolt In The 200 And Blake In The 100 Jamaica had to choose between athletes since each country can only have one wild card per event. The defending World Champ as well as DL series winner gets an automatic bid, so Blake and Bolt both had the 100 and Bolt and Nickel Ashmeade both had the 200. Long Jump WR Holder Mike Powell Teaches Youth Class In Moscow He said that he thinks he can coach Bolt to jump 9 meters in the LJ, but he joked that Bolt might get injured as "he'd probably jump over the pit." Sally Pearson Will Compete At June 27th Ostrava Golden Spike Meet, Coming Back From Her Second Hamstring Injury Of The Year She and her coach say things are coming along nicely, but they did take notice of Brianna Rollins' 12.39 at the NCAAs last week. LRC Women's 1,500: Oklahoma State's Natalja Piliusina Weaves Her Way From Seventh To First In The Final 100m To Win Florida's Cory McGee ended up a well-deserved second in 4:13.94. LRC Women's 3,000m Steeplechase: Emma Coburn Wins Her Second NCAA Steeple Title As Colleen Quigley Gets The "A" Coburn got the win here, but wasn't nearly as dominant as she usually is in an NCAA steeplechase, as FSU's Colleen Quigley finished only 2.85 seconds back after a fast last lap. *Emma Coburn Signs With New Balance To Begin Her Professional Career She's decided not to hire an agent. *2nd Coburn-NB article She'll stay in Boulder to continue to be coached by Mark Wetmore and be a volunteer assistant at CU. She said, "In all of my conversations with companies, I made it very clear that no matter what, I'm staying in Boulder. No one protested ..."
Team Competition (Kansas Wins, Oregon Denied The Triple Crown): Kansas Wins First Women's NCAA Title In School History Stanley Redwine's program has risen as the Jayhawks look to recapture the track and field glory they used to enjoy when it was a men's only program. Kansas won with 60 points to Texas A&M's 44 and Oregon's 43. *Oregonian: Oregon Women Unravel, English Gardner shocks everyone and says she's going pro early All we can say is good luck getting a big deal from Nike. Of course, it might look bad for the Swoosh if the beloved Gardner signs with someone else. *Brianna Rollins Runs 12.39 In 100H WOW is all we can say. Truly incredible. LRC Women's 5,000: Abbey D'Agostino Repeats And Denies Jordan Hasay The Storybook Ending Hasay somewhat surprisingly had the lead on the last lap and the Oregon crowd was going nuts until Abbey D battled back and won going away. LRC Women's 800: Natoya Goule Completes Undefeated Season and Pulls Five Others To Lifetime PRs Goule became the 4th-fastest collegian in history and just missed the coveted 2:00 barrier as Oregon's Laura Roesler had to settlle for runner-up honors. Register-Guard: It's A Magic Moment For English Gardner In The 100 As Her 10.96 Victory Leads Oregon's 32 Points On Friday To Make It A Title Race Our interview with Gardner is here. UO Coach Robert Johnson: "It's not over yet. I think we still have some battles to fight. But anytime you have that big of a deficit, you really have to get going. We have to find those points somewhere." US Half Champs Are This Weekend: Kara Goucher Will Be In Duluth To Watch US Half Champs/Grandma's Marathon She says if she makes the team for Moscow, she'll race the NYC Marathon in the fall, but if not, she'll do Chicago. Desiree Davila is racing US Half Champs and Mohamed Trafeh is in the men's race against Abdi and Meb.